The Juju UI Engineering team has been hard at work on a whole new way to visualise your Juju deployments. Juju provides a unique perspective on your workloads as it focuses on the services that perform the work and less on the hardware details as that’s malleable and transient from deployment to deployment and cloud platform to cloud platform. However, there are times when knowing exactly how services are deployed is vital to diagnosing and managing cloud environments. 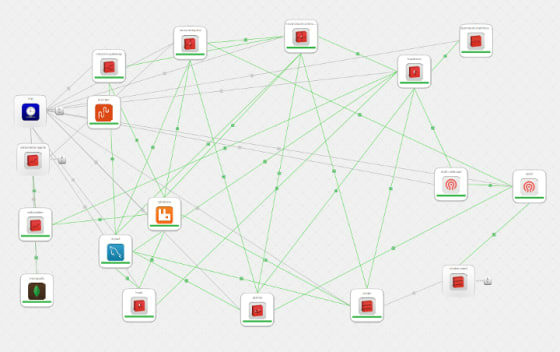 For instance, take a look at this image from the Juju GUI of an OpenStack deployment on an Orange Box. This is a great-looking bundle, but there are more than 17 services and the Orange Box only has 10 nodes. How is this environment deployed across those ten nodes? Now you can answer that question with the Juju GUI machine view. The machine view shows you clearly how many machines there are in your environment, what services are located on each node, and how the units of each service are placed. The machine view provides several useful tools for managing your Juju environment. There is a column dedicated to exactly what you’d expect, the machines you’re running. Each machine provides information about what services are operating on it, any hardware characteristics we can extract from Juju, as well as a UI for adding new machines and removing unused machines. When you select a machine you can view the containerisation on that machine. Here you can create lxc and kvm containers on providers where Juju supports networking to those containers. You can also co-locate services on the same machine without lxc or kvm containers. This way you can make the most of your hardware by placing multiple services together. Another new concept is the deployer bar. This bar stores all the changes you want to make to your environment so that you can think through your deployment. You can deploy services, place them on specific machines, and configure them without actually making any changes to the live environment. A blue circle indicates that the item is not yet committed. To commit the changes, click on the commit button in the bottom right corner. This will bring up a summary of all planned changes. Once you’ve confirmed the changes, Juju will start updating your environment. At this point, you’re free to build up a new set of changes. They stack up in a queue and allow you to carefully build out your deployment. If your changes don’t look right, then you’re free to cancel them and start over or think about it more tomorrow. We believe the machine view will provide a great chance to see your Juju deployments in greater detail, when necessary. You can swap back and forth between the service view and machine view at any time. We’ve put together two videos that walk you through some sample use cases for machine view. You can see them embedded at the top and the bottom of this page. Make sure to give them a look and see how the Juju GUI can help you visualise and manage your workloads in ever more powerful ways. Check out our new work and tell us what you think. We’re always available to help answer questions on Freenode at #juju-gui or on the Juju mailing list, juju@lists.ubuntu.com. Remember, the Juju GUI is open source and we’d love to help people participate using our Github home at https://github.com/juju/juju-gui.